I was the lucky recipient of a very pretty and generous giveaway. Given my recent love affair with grey, it was tailor-made for me. Fellow Canadian Jenna Rose sent me such a lovely package. 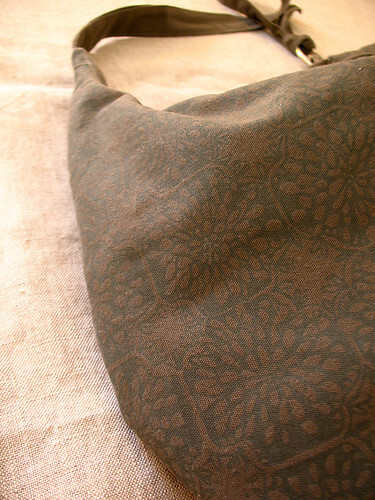 She creates gorgeous products from her own screen printed fabrics. I highly suggest you check out her shop because my photos here don't do these justice. The quality is lovely, everything is beautifully made! 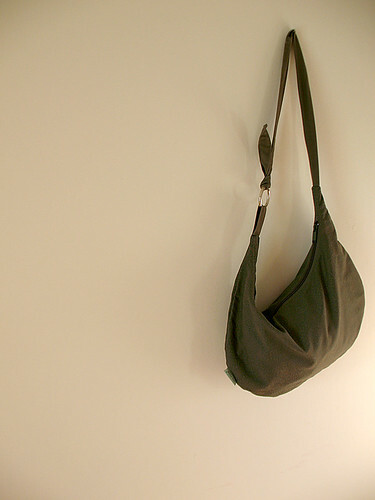 This canvas hobo bag in the mum pattern is super cute, perfectly proportioned and so comfortable to wear. 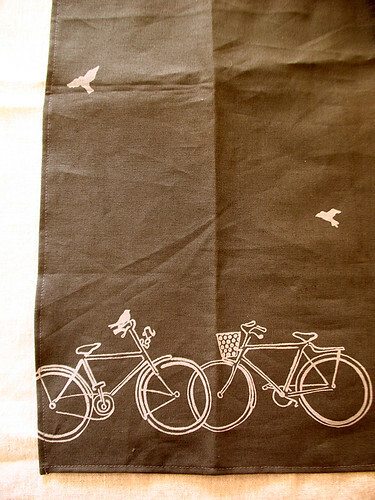 How charming is this bicycle print tea towel? I must admit I can't imagine wiping my hands on it. I think I might use it as a little wall hanging. 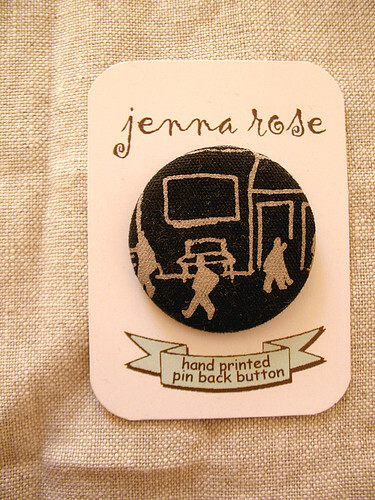 Isn't this little cityscape pin cute? Thank you so much, Jenna Rose! A little apology to all the sweet peeps that have left me comments lately. I just did the switch-over from the old Haloscan back to Blogger comments, but unfortunately that wiped all my comments out. I had to switch, because I hated Haloscan's replacement, Echo. I had no way of replying to comments directly, which is why I haven't been answering you all. I'm making good on my New Year's resolution, not dwelling on what I don't love (a torn ACL which means no x-country skiing this winter, and a blood clot in my leg that may or may not be a deep vein thrombosis) and instead being mindful of what I do love (insurance-covered weekly massage therapy, an excuse not to do housework, and more knitting time). 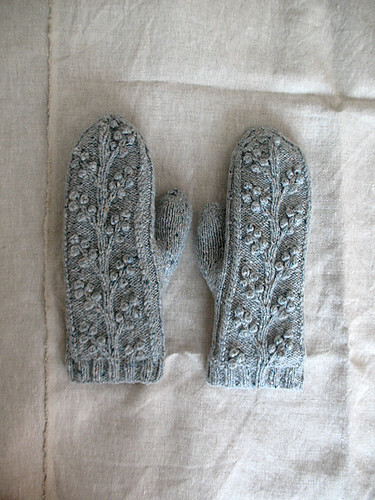 Recently completed Regina Mitts. Details here. Jo Sharp Silkroad DK, gifted by a sweet bloggy friend. 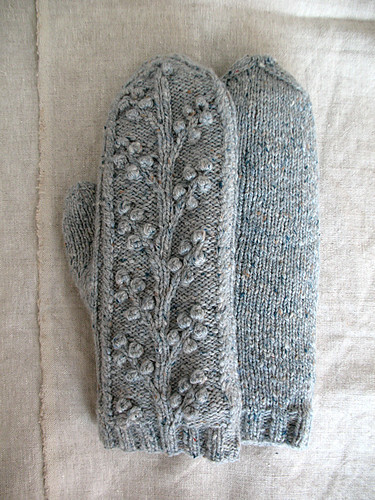 Covering older and not-warm-enough mitts with shiny new ones. I also love toasty fingers. 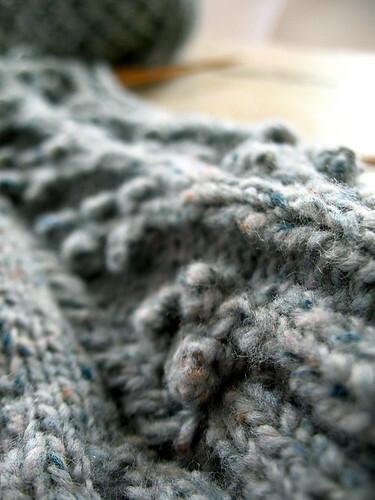 More Jo Sharp Silkroad, bought on sale with a Christmas gift-certificate, and used to test knit for another sweet bloggy friend. 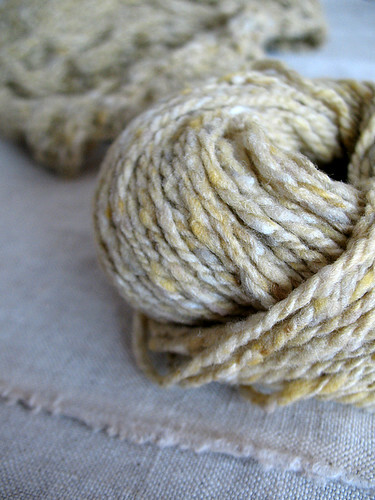 I especially love the soft beeswax yellow with grey flecks. 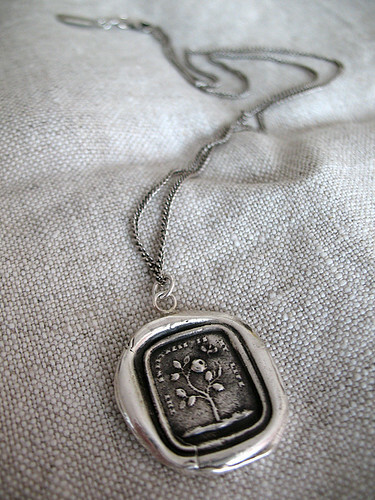 A beautiful silver necklace from my love that reads "Thy sweetness is my life". Have yourself a sweet-filled weekend! 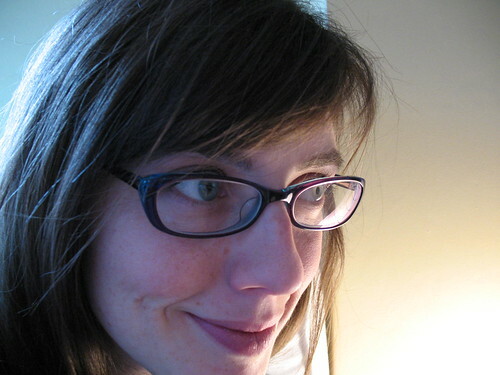 Goodbye, crazy 2009, hello quiet and cozy 2010 (at least, that's what I'm wishing for). My new year's resolution is to be mindful of what I love, and not dwell on what I don't love. 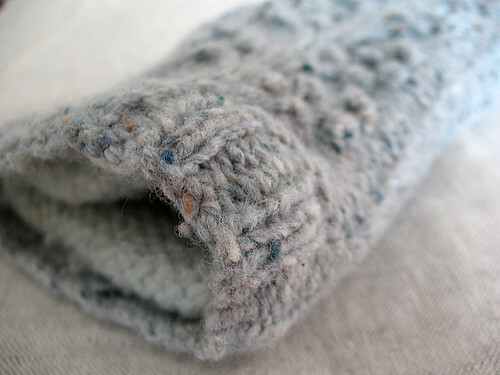 Today I love: tweedy wool, soft colours, tiny bobbles. Hope your 2010 is what you wish for too.